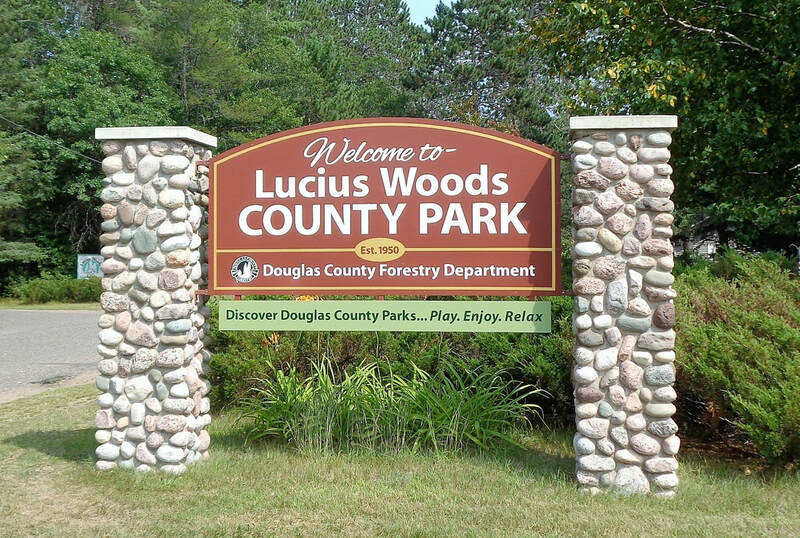 The Lucius Woods Performing Art Center, truly a symbol of the Wisconsin northwoods with its log construction, is located in the 40 acre Douglas County park of Lucius Woods Park which backs up to the Upper Saint Croix Lake. Since 1994, many, many have enjoyed its summer Saturday evening concerts. How did it start??? In 1992, Solon Springs, a nearby village, had been looking for ways to enhance its economy and one idea was to create a performing arts venue in the natural bowl terrain of the park. Mary and Frank Giesen loved the idea and spearheaded it by forming a Board of Directors. With the help of the WI Arts Board, they brought together resources and created a 501(c)3 nonprofit, Lucius Woods Performing Arts Center. The Giesens provided both time, energy, and leadership in organizing the fund raising needed to build the structure. The cost was about $100,000 plus all the many generous in-kind donations. In 2005, the bandshell was named the Giesen Concert Shell in honor of the hard work and dedication of Mary and Frank Giesen. Blesener Dahlberg Architects ARA of Duluth was hired with Robert (Rob) Prestidge working as the lead architect and coordinator of the project. Steven Orfield of Orfield Associates, Inc. of Minneapolis, a firm specializing in acoustic design, recommended the interior panels be placed in a bellow pattern to promote reverberation of sound to send it out across the landscape. The shell was erected by Four Star Construction of Superior. It was completed and ready for its first concert season in 1993. Red pine logs were used for the exterior and tamarack panels for the interior. Local wood from Gordon, Douglas County, WI, was harvested for it. ​Music in the Park has been a success since its inception and has always offered musical entertainment on Saturday evenings during the summer. There is a charge for each performance; seasonal passes are available at a discount. Chairs are set up, but often people bring their own and place them next to or in back of the ones provided. A concession stand operated by the Solon Springs Rotary Club offers food; many bring their own picnic. The nonprofit arranges the programming while the bandshell is operated by Douglas County and can be rented through Douglas County Forestry. ​Lucius Woods County Park offers fishing, boating, canoeing and kayaking, and a beach area at the Upper St. Croix Lake. Camping, hiking, and picnicking is also offered.